Home » game recap » Did Lou concede yesterday’s game? 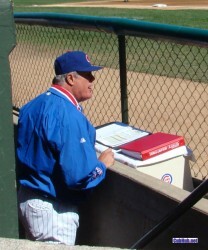 Cubs manager Lou Piniella filled out a most unusual lineup card yesterday. He started just two regulars (Derrek Lee & Kosuke Fukudome), one rookie’s first every MLB game (Bobby Scales), and his #5 starter (Sean Marshall) to face reigning National League Cy Young Award winner Tim Lincecum. It sure seems to me that Lou conceded that Lincecum was going to be tough so he would rest his regulars to prepare for a road trip agains two division rivals in the Astros and Brewers. I’m not entirely against Lou’s plan here, but I cannot recall a circumstance like this in the past where a manager did not put out the very best lineup to get a win. Usually, you rest a guy here a guy there and everyone stays fresh. But to send out a lineup that reads like a Baseball America report from 2007 against arguably one of the best pitchers in the league is something I can’t recall having seen before. Lou’s lineup scattered just four singles and a Derrek Lee double for grand total of two runs to lose the game 6-2. Let’s just hope throwing this game doesn’t figure into winning the divison or Wild Card this year. I don’t know that any team can afford to give away games.